Join us on April 6th as we allow these gorgeous glamazons to duke it out to win the crown of Miss LSVA for charity! Doors open at 6, show starts at 7. 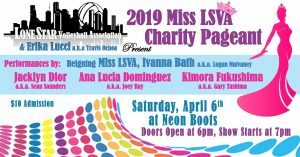 Contests include: Jacklyn Dior (Sean Saunders), Ana Lucia Dominguez (Joey Ray) & Kimora Fukuskima (Gary Tashima), lead by reigning Miss LSVA, Miss Ivanna Bath (Logan Douglas Mulvaney) and the immortal Erika Lucci (Travis D. Ochoa – Grossman).